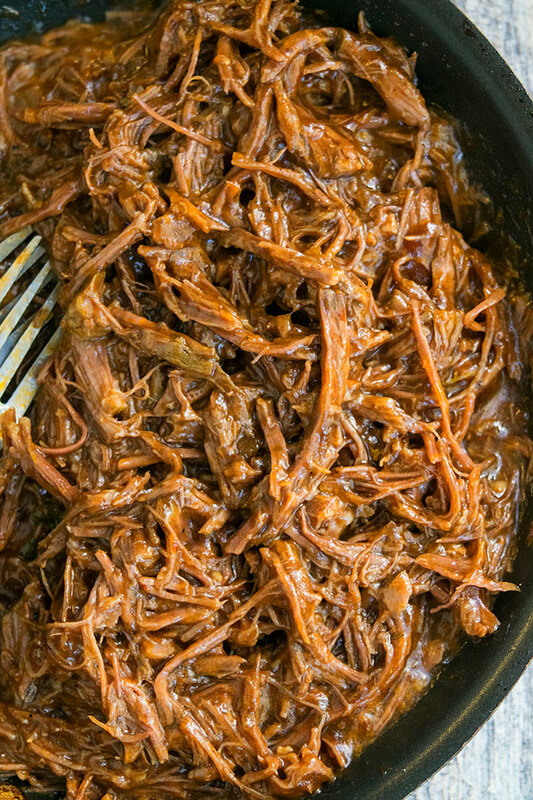 Quick & easy bbq shredded beef recipe, made in one pot in oven/ stovetop with simple ingredients. Juicy, tender, great for tacos, enchiladas, sandwiches. My family has at least 5 different recipes of shredded beef but this BBQ shredded beef was my personal favorite version, growing up. It’s just as flavorful as my One Pot Mexican Shredded Chicken Recipe. 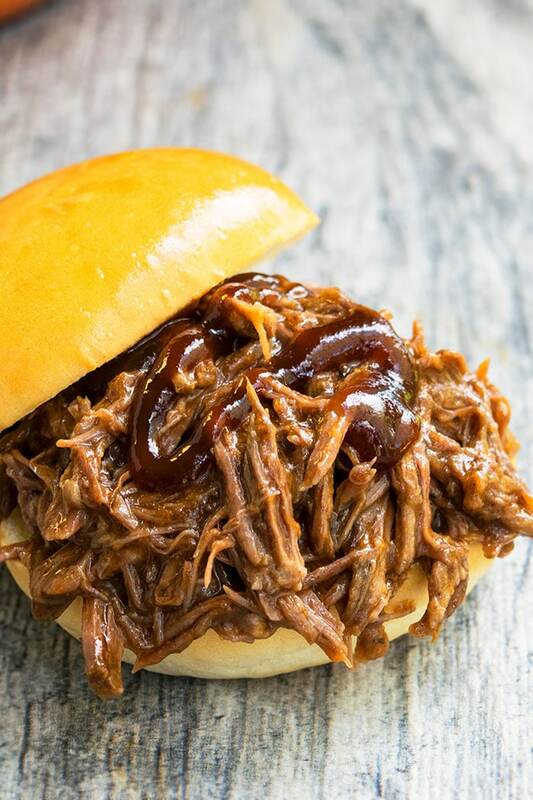 The beef is tender and juicy and loaded with bbq sauce. What kind of beef is used for shredded beef? 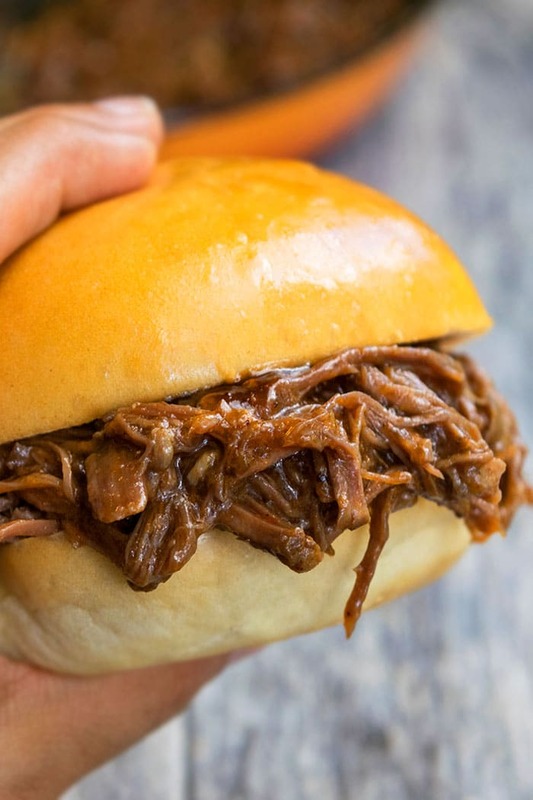 What beef do you use for pulled beef? What cut of beef is best for shredding? Chuck roast is best because it’s very tender and can be shredded easily. What is shredded beef called? It’s also called pulled beef. How do you cook barbecue beef? 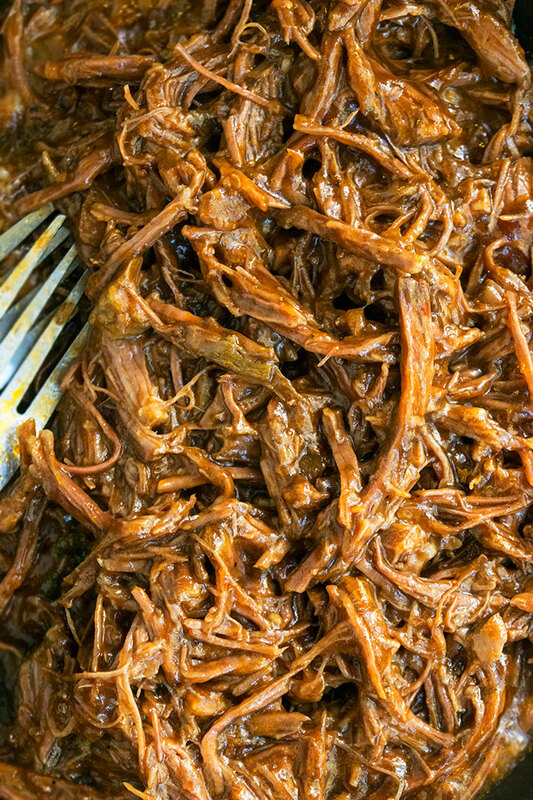 How do you make pulled beef in the oven? 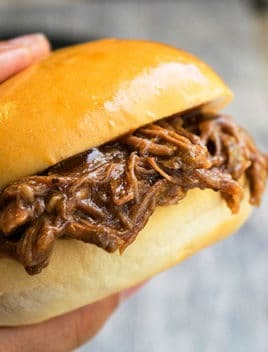 How to make BBQ shredded beef? Heat oil and sear the roast. Add garlic, onion, salt, pepper, bbq sauce and mix everything together. Cook in the oven for 3 hours at 325 degrees. Shred with 2 forks and you are done. My favorite way to enjoy this beef is in sandwiches. You can really take it over the top with the toppings you choose like lettuce, tomatoes, pickles, cucumbers, onions, olives. cheddar cheese. Don’t skip on searing the roast. It gives this recipe a better flavor and texture. Use any bbq sauce you like- store-bought or homemade. Add additional seasonings if you like. Additional liquid is not needed in this recipe or else it will end up being too watery. If the roast is too watery, just reduce the liquid on the stovetop by cooking it without the lid for a few minutes. Add all the ingredients plus 1/2 cup beef broth (low sodium) in a crockpot and cook on low for 6-8 hours and then shred with forks. Start off by searing the roast in the instant pot, using the saute setting. Then, seal the lid and cook on manual for 50 minutes. Release pressure and shred beef. Made with very few, simple ingredients that you already have in your kitchen pantry. Use this beef to fill hard or soft tacos, along with any toppings of your choice. Use this beef to fill sliders, along with additional bbq sauce, some mozzarella cheese and lettuce. A quicker version can be made in an instant pot, which will take less than 1 hour. Heat oil in an oven-safe nonstick pot over medium-high heat. Add the roast and sear on all the sides. Add barbecue sauce, salt, pepper and mix everything together until roast is fully coated. Cover and cook in the oven at 325 degrees for 3 hours, making sure to mix everything together halfway through. Cook on the stovetop to reduce liquid to your desired consistency. Fill sandwiches with this pulled beef and enjoy. Oh my gosh, this look so insanely delicious! I love quick and easy recipes like this, yum! This looks SO amaaazing!! I LOVE the flavors!! I can’t wait to try it! This looks amazing!! Making this ASAP! This needs to happen at my house very soon! My husband definitely love this! I need to try this! Thanks for the tips!